Mexico City. Earlier this morning, Mexican President Felipe Calderón led the launching of the Mesoamerican Health Initiative 2015 at the National Anthropology Museum in Mexico City. “Today, we have been brought together by solidarity, the will to cooperate, and a joint commitment to the inhabitants of Central America and the entire Mesoamerican region,” he remarked. 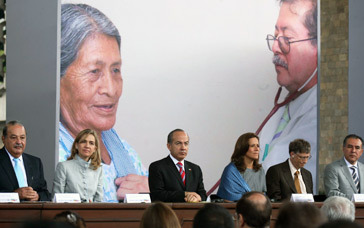 At the National Museum of Anthropology and History, the President declared that this is a shared effort by the Spanish government and the Carlos Slim and Bill & Melinda Gates Foundations, which will contribute 150 million pesos, administered by the Inter-American Development Bank for the benefit of over 10 million people threatened by preventable or curable diseases. “The project has proved that it is a powerful instrument for promoting economic and social development and that it involves the joint work of the countries in the region and of course, international cooperation,” he added. First. By fighting extreme poverty and hunger, which will reduce child malnutrition and anemia. The goal is to reduce the prevalence of low stature from 30.5% to 25.5% and the incidence of anemia in children under five from 32% to 23%. Second. By reducing child mortality. The goal is to achieve universal vaccination coverage and reduce neonatal mortality by 30 per cent. Third. By improving maternal health. The goal is to achieve the UN commitment of reducing maternal mortality by 75% between 1990 and 2015. Fourth. By reducing vector-borne diseases, in other words, those transmitted by the bites of insects such as mosquitoes. This will support programs to prevent, diagnose and treat cases of malaria and dengue. The goal is to reduce malaria control and halve the incidence of dengue in these countries. “I know that by combining efforts between the public and private sector, sharing responsibilities and utilizing the transforming power of human solidarity, shared social responsibility and international cooperation, we will build a better Mesoamerica, advance towards combating the poverty suffered by our people and above all, guarantee better access to health conditions,” he said. The event was attended by Princess Cristina of Spain; Bill Gates, of the Bill & Melinda Gates Foundation; Carlos Slim Helú, of the Carlos Slim Foundation. Luis Alberto Moreno, President of the Interamerican Development Bank; Marco Antonio Slim Domit, President of the Carlos Slim Health Institue; Trinidad Jiménez García-Herrera, Spanish Minister of Health and Social Policy; and Secretaries of Foreign Affairs, Patricia Espinosa Cantellano, and Health, José Ángel Córdova Villalobos.